These sweet turmeric pickles are great for serving in a relish tray. They‘re flavored with tumeric--kind of an old spice that you don‘t hear about anymore, but that is still available in the spice section of your grocery store. This recipe is one my Grandma made every year and then brought them out at meal times and especially holidays. 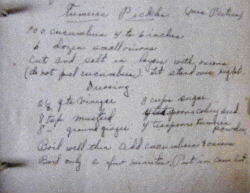 I hadn’t made these pickles myself yet (it‘s winter and I won‘t see pickles for awhile), but wanted to get the recipe posted since it is a tried and true family recipe, when I found the original in Gram’s handwritten recipe book. She noted that it came from a Mrs. Peters. I think this book is actually from when my Gram was about 20 years old and this recipe came from a woman she worked for. I also noticed that Gram modified this recipe quite a bit since it was made back in her twenties--you'll notice she took out the ginger. Wash and cut your cucumbers into chunks. Place in a large pan or bowl with the water, onion and salt. Let them soak for 24 hours. In a large kettle, mix your sugar, vinegar, tumeric, mustard seed and celery seed. Heat on high, bringing to a boil. When the brine is boiling, drain your cucumbers and onion and add them to the brine mixture. Turn the heat down and simmer them until they turn yellow (or pale green). Do not drain them. In a separate kettle, put your lids and rings in, with enough water to cover them and bring them to a boil. Pack the chunks and onions into canning jars and pour the remaining brine over the pickles, evenly between each jar, and cover with a lid and ring. Place the quart jars in a canner or large enough pot to hold all the jars (again, these pickles aren't pressure canned but the canner works really well for this job) and cover with water. Put the cover on and bring them to a boil. When the pickles are boiling, turn off the heat. Leave the pickles in the canner until completely cooled. Click here for more great canning recipes like Sweet Turmeric Pickles!